The memories of my Granny mixing raw mangoes with coarsely pounded fresh spices and a generous amount of mustard oil is still sharp in front of my eyes. The little me watching her seasoning pickles, or making the evening snack Jhaalmuri much tastier with just a few golden drops of mustard oil was exhilarating, I started believing not only in the fairy tales book magic happens over food also. She used to get her monthly supply of Cold pressed Mustard oil from a local oil seller. Of course, then as a kid, I haven’t realized what the importance of unadulterated Mustard oil is. But lately in my growing up years I’ve experienced several health benefits of it. I consider myself blessed that I born and brought up in the eastern part of the country, a region whereas a cooking medium mustard oil was used primarily. But nowadays as there are plenty of oil options available in the market, and they’re all promising good health this way or the other kind of making us confused. We’re still not sure that picking up a refined oil pack for our family is the right choice or not. Studies revealed that during its enhancement process refined oil gets many chemicals into it which are harmful to our body. The machinery process of extracting oil from the seeds generates high heat which causes loss of nutrients in the refined oil. On the other hand, the age-old cold pressing method considered as the safest process of making oils. Here the mustard seeds get crushed under a certain amount of pressure to release the purest form of oil. That’s why all the anti-oxidants remains intact here, good fats such as Omega-3 & Omega-6 supports the heart health, and free from trans-fats makes it best fit for cooking. Point to remember not to heat cold pressed oil for a longer duration because we don’t want to lose all the good nutrients which the oil has to offer. I’ve recently introduced to 24matra Organic Mustard Oil, and I’ve cooked several dishes with the oil until now. Used it raw in my salads and snack mixes as well. Like other mustard oil varieties while you heat up this oil for cooking it doesn’t release that much strong mustard whiff which usually makes eyes teary. The aroma is more alluring here that stays with every morsel of the dish. Apart from cooking the flavour & taste of pure mustard oil gets more enjoyable while we use it raw over food. And that is the beauty of cold pressed oil. It’s a common practice to cook mustard based dishes in mustard oil. It enhances the flavour profile of the food. 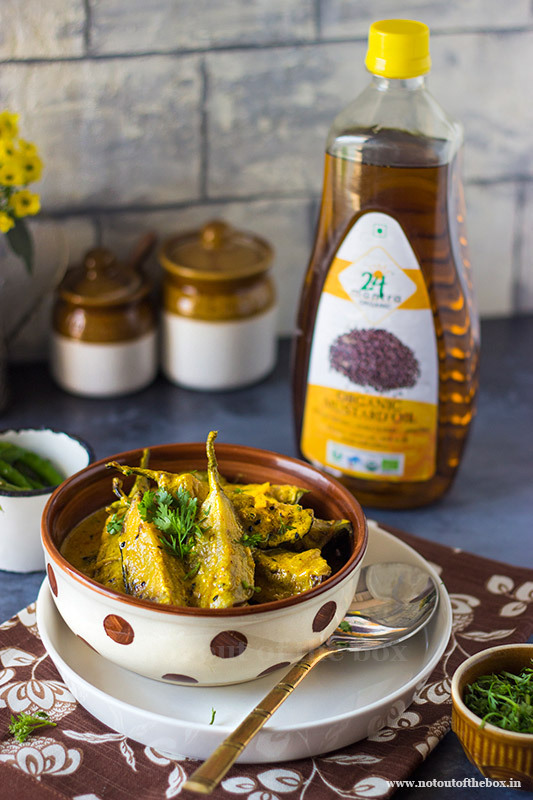 In this Eggplant Mustard Curry fried eggplant slices cooked in a tangy-spicy gravy which make them ready-to-melt later. Make sure you’ve plenty of rice/roti to pair it with. Portion control will not work here. 🙂 Below is how to cook it. 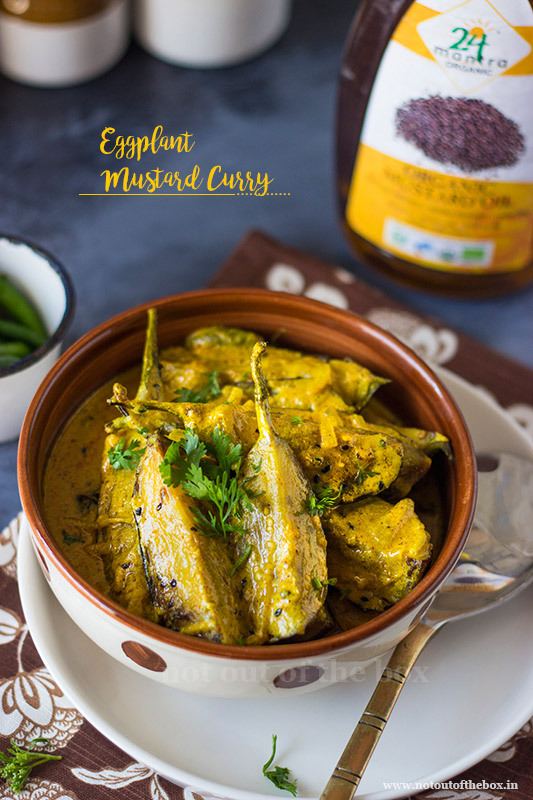 Eggplant Mustard Curry/Begun Basanti is a traditional Bengali dish. Fried eggplant slices cooked in a tangy-spicy gravy which make them ready-to-melt later. 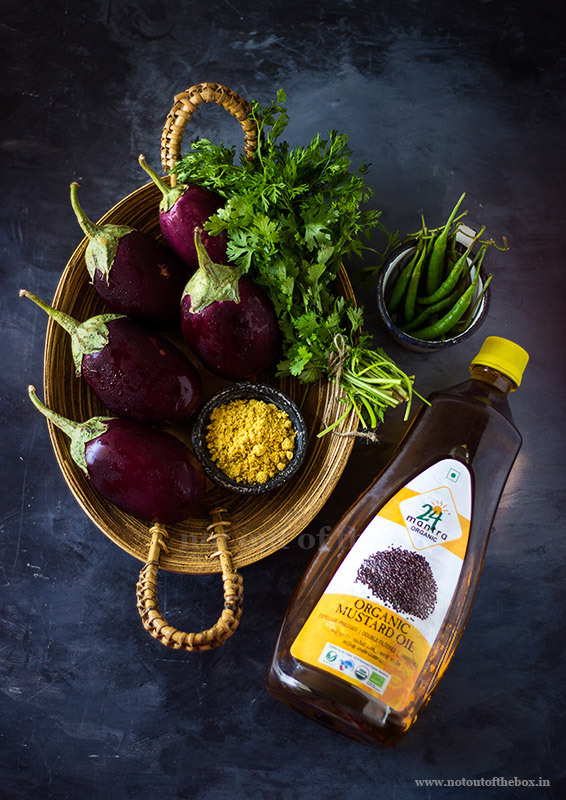 In a strainer add 2 tbsp of yellow and 2 tbsp black mustard seeds (50:50), wash under running water, and grind with one green chilli to a smooth paste by using your food processor. Or else, you can use ready to use mustard powder (Sunrise brand). If cooking with the mustard seeds powder, use 2 tbsp of it and follow the package instructions for dissolving. Wash and cut eggplant vertically into wedges. In a bowl whisk the yogurt. Add mustard paste, turmeric powder, kashmiri mirch powder, and salt. Mix well and keep aside. Over medium heat add oil in a deep frying pan/kadai. Add eggplant wedges and sauté until golden in colour. Remove from the heat and keep aside. Add 1½ tbsp oil to the kadai and temper with nigella seeds. Next to add sliced onions and sauté over medium heat until light brown. Lower the heat, add 1/2 cup of water into this. Now add the yogurt mixture, sugar, and green chillies. Mix gently. Cover and cook over low heat for 10-12 minutes or until the curry thickens. Now add the eggplant slices and sugar into the curry, mix slowly, and cook uncovered for 5-6 minutes. Remove from the heat. Drizzle mustard oil on top and garnish with chopped coriander leaves. Serve hot as a side with rice, dal or have it with roti/paratha/phulka etc. Enjoy!